Happy National Cream Pie Day! Wait, you did know it was National Boston Cream Pie Day, didn't you? Well, it's ok, because even if you didn't, I did. And I also had the foresight to notice that October 23 is pretty darned close to Halloween, and so in an effort of Seasonal Fusion, I'd like to present the famous pie all gussied up for the holiday! That's right. 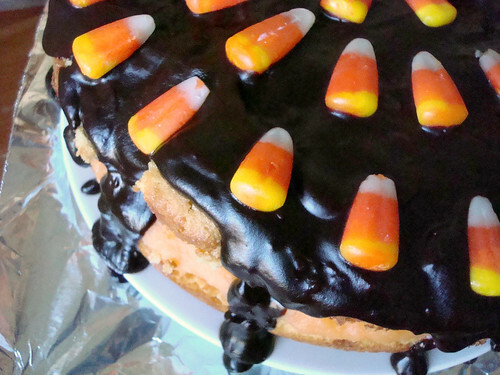 Candy Corn Boston Cream Pie! 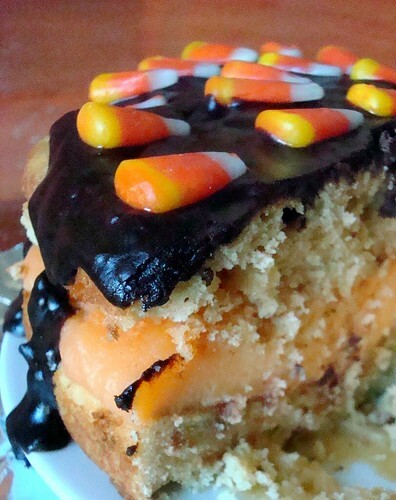 This recipe is pretty classic, but with a heaping handful of candy corn in every step for added awesome; also, I top mine with a ganache because I really didn't have the time to do a homemade chocolate fondant (and also, to be quite honest, I like the ganache better. It's a lot creamier. C.R.E.A.M. Yes! 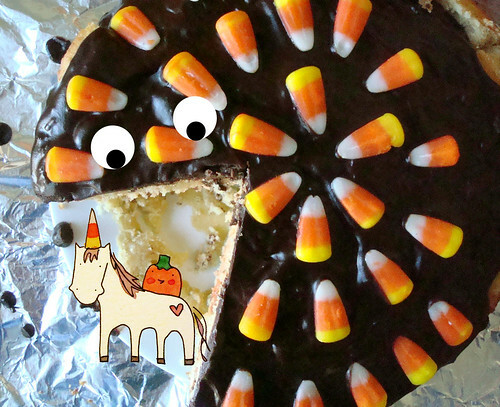 Adding Candy Corn isn't necessary to make this Boston Cream Pie delicious, but it adds a fun lowbrow turn to a fancy-ish dessert. 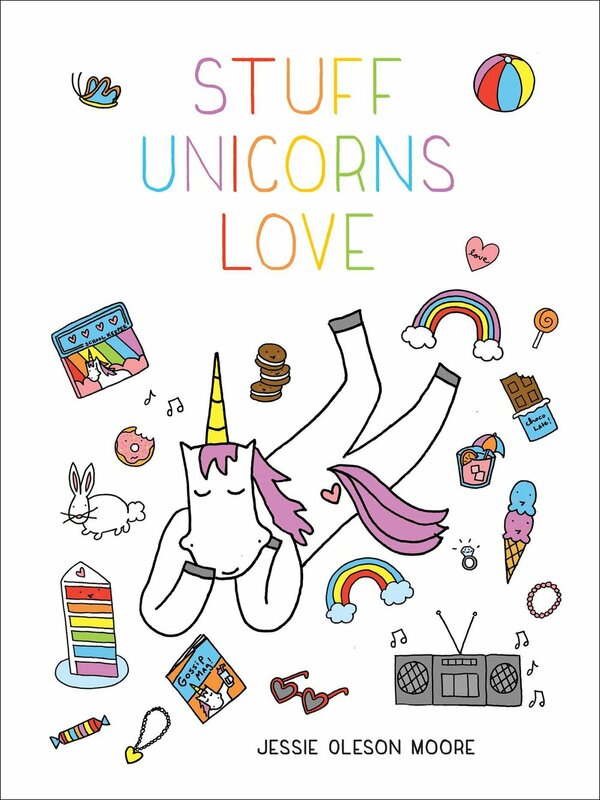 Plus, it's fun and sweet. VERY sweet. Preheat the oven to 350 degrees F. Grease and flour the bottom and sides of a 10-inch springform pan. Carefully separate the eggs, putting the whites and the yolks in a separate large bowls; make sure there are no specks of yolk in the egg whites (the whites won't whip properly if there are bits of yolk mixed in). Add ½ cup of sugar to each bowl. In the bowl of an electric mixer fitted with the whisk attachment, beat the egg whites on medium-high speed until they form stiff peaks; set aside. Using an electric mixer or by hand, beat the egg yolks until they are thick and pale yellow in color. Stir about one quarter of the whites in to the yolks to lighten the batter, then gently fold the rest of the whites into the yolk mixture. Whisk the flour into the egg mixture using a large balloon-type whisk, working carefully to minimize the deflation of the batter. Then, still using a whisk, stir in the melted butter. Fold in the candy corn. Pour the batter into the prepared cake pan, filling it about ¾ of the way, and bake for 15 to 20 minutes, or until a toothpick comes out clean when it's inserted into the center of the cake. Let the cake cool in the pan for about one-half hour, then remove it from the pan and transfer to a wire rack to cool completely. To assemble the cake, using a long serrated knife, slice the cake horizontally into 2 equal layers. Place one of the cake layers, cut side up, on top of a sheet of parchment paper (this will catch any drips, and allow easy cleanup before transferring it to a serving platter). Spoon the pastry cream onto the center of the bottom layer, leaving an inch and a half uncovered on all sides—the weight of the top cake layer will spread it to the edges. Place the second layer of cake on top of the pastry cream. Using a ladle, spoon the still slightly warm chocolate glaze on the top of the cake, allowing it to gently drip over the sides of the cake. 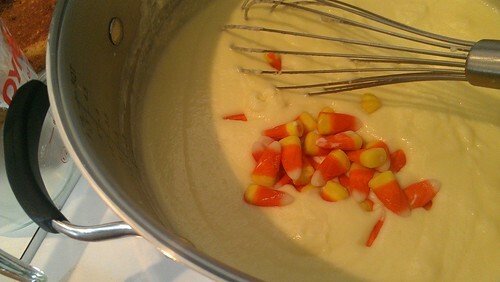 Gently press the candy corn around the sides or on the top. Serve immediately at room temperature, or refrigerate for up to 2 days, well wrapped, and bring to a cool temperature before serving. In a medium saucepan over medium-high heat, combine the butter, milk, and cream. Bring to a simmer, then remove from heat. Pour the mixture into a medium-size pot and place over medium heat. Cook, whisking constantly to keep the eggs from scrambling, until the mixture begins bubbling. Continue whisking until the mixture has thickened to the consistency of a pudding; this will happen shortly after it comes to a boil, about 15 minutes. If any bits of egg have cooked, forming lumps, strain the mixture through a mesh sieve. Transfer to a bowl and fold in the candy corn. They will "bleed", giving the cream a light orange color. Press plastic wrap directly onto the surface of the custard, to keep a skin from forming. Let cool completely in the refrigerator before using. In a medium saucepan over medium heat, bring the cream to a boil. Place the chocolate in a medium bowl; pour the hot cream over chocolate, stirring until chocolate is melted and well combined. Set aside to cool slightly, about 10 minutes.